This #GivingTuesday we received a California Legislature Assembly Resolution for DAC! Thank you, AssemblyMember Ash Kalra! We appreciate your support! 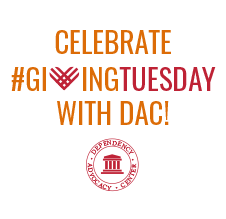 Be part of DAC’s first #GivingTuesday! Giving Tuesday is an inspiring global movement that harnesses the collective giving power of individuals, families, organizations, and communities, celebrated on the Tuesday following Thanksgiving. #GivingTuesday signals the start of the charitable season, when many people pay extra attention to the individuals and organizations who benefit most from their holiday and end of year giving. How can I support DAC on #GivingTuesday? This year, Dependency Advocacy Center (DAC) is participating in our first ever #GivingTuesday! Over the last ten years, DAC has had the privilege of providing interdisciplinary family defense advocacy to over 7,800 low income, underserved parents and children in Santa Clara County’s child welfare system. By combining a skilled dependency attorney with the clinical expertise of a licensed social worker, and the compassionate, lived experience of a mentor parent, DAC has offered meaningful access to justice for the vulnerable population we serve. 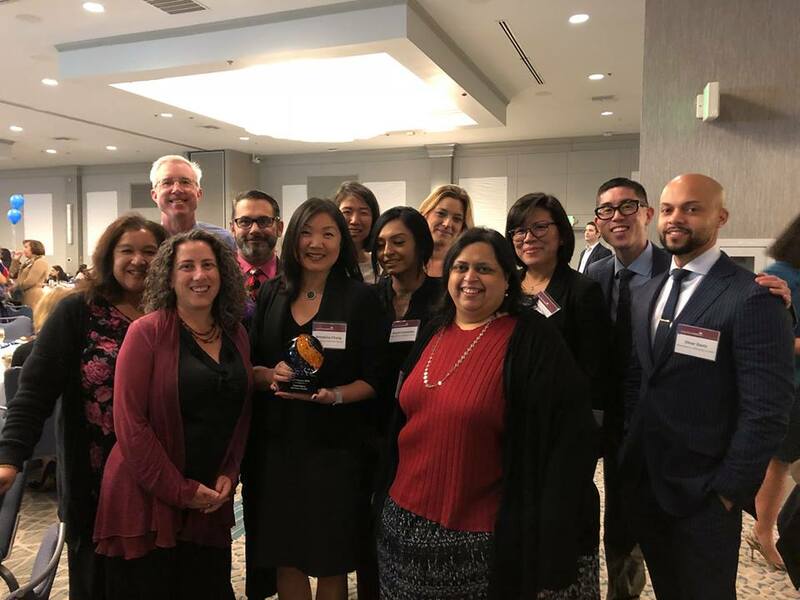 Our unique approach to client representation has directly impacted parents like Alyssa Lopez, DAC’s 2018 Outstanding Parent Award recipient. With the support and guidance provided by our holistic approach, Alyssa has made huge strides in building the safe and stable life that she has wanted for herself and her three sons. With your #GivingTuesday donation, parents like Alyssa will receive the help that they need to support their reunification and ensure their family’s long-term success. 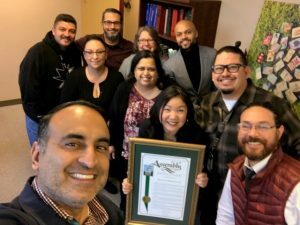 Our goal is to raise $5,000 to continue advocating for the families of Santa Clara County. You can text your donation to (408) 883-4074 or click here! Thank you for helping DAC strengthen families and communities! 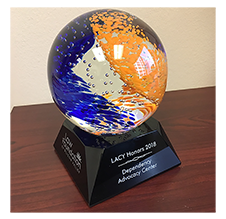 On November 9, 2018, Dependency Advocacy Center proudly received the Law Foundation of Silicon Valley’s 2018 LACY Honors award for our family defense work on behalf of underserved parents and children in Santa Clara County. 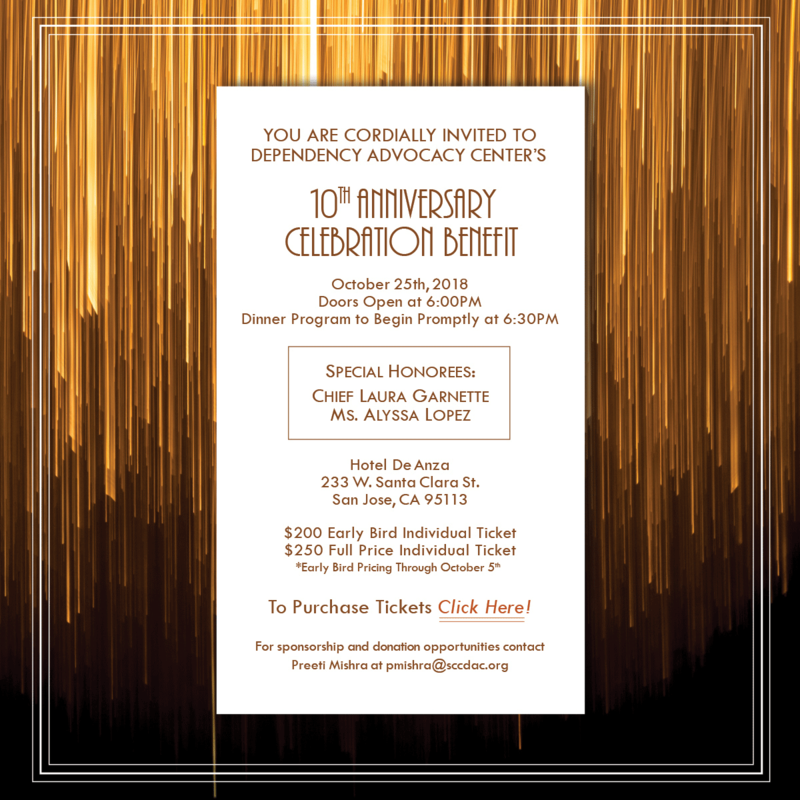 DAC celebrates its 10th Anniversary! 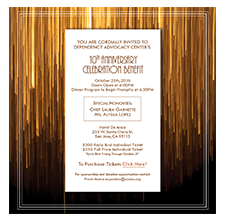 We are grateful for the privilege of providing 10 years of family defense advocacy for underserved parents and children in Santa Clara County’s child welfare system. 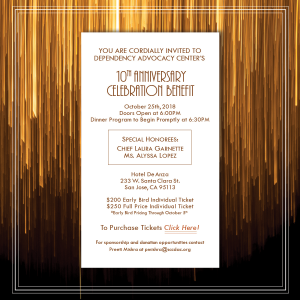 On October 25th, we celebrated this milestone with a sold out event at the Hotel De Anza, where we honored DAC’s 2018 Outstanding Parent Alyssa Lopez and DAC’s 2018 Distinguished Advocate Probation Chief Laura Garnette! Thank you to the many attendees, supporters, and sponsors who contributed to the evening’s success. We couldn’t have done it without you!